For those with automatonophobia (fear of humanoids), SimMan is a little unnerving: those blinking eyes, the labored breathing, that manufactured voice. 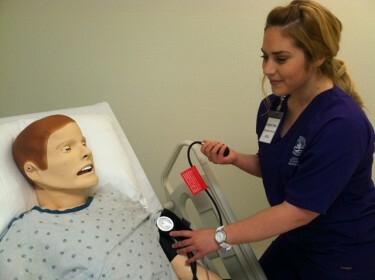 But for dozens of nursing students in a new Grand Canyon University cohort program in Sun City, SimMan is a lifelike marvel they use to practice and hone the skills they need to provide safe clinical care. The human patient simulator is part of Banner Boswell, a 21,000-square-foot site with a state-of-the-art skills lab, classrooms, computer lab, home-health apartment and patio with a zen-inspiring view of Sun Lake and its graceful black and white swans. SimMan receives plenty of attention from the nursing students in GCU’s new Sun City program. In August, 42 GCU students began courses in the pre-licensure program, and each semester 40 additional students will be added to the cohort, with a cap of 160 students. There also are cohorts for RN-to-BSN and master’s degrees at Banner Boswell. Located across the street from Banner Boswell Medical Center, and in partnership with Banner Health, the site is the seventh cohort in GCU’s College of Nursing and Health Care Professions. The location could not be better, said site director Dr. Roni Collazo. Dressed in purple scrubs, students take classes and then apply their knowledge in the six-bed skills lab, where volunteers from the Banner Boswell auxiliary allow them to perform intake interviews and health assessments. Down the hall in the simulation lab, the students take turns caring for SimMan in one of four hospital rooms. They don gloves and yellow paper gowns, then knock on his door, enter his room, and offer him physical, psychological and spiritual care. They can monitor his heart and oxygen levels, start IVs and look in his ears, ask about his family and tell him Jesus loves him. It can be an awkward, uncomfortable experience for a nursing student, but the point is to eliminate the nervousness and uncertainty before being out in the working world. On a recent morning, students Erik Hernandez Jr. and Nick Burnette are up to bat. They introduce themselves to SimMan. Via a control room outside his hospital room, Denise Turner, an adjunct faculty member in CONHCP, voices his responses and reactions, which include crying about his wife who recently died. After the exercise, 20 students and Assistant Professor Amy Johnson gather to discuss Hernandez’s and Burnette’s performance. Noting that SimMan had a pack of cigarettes and a lighter in his hospital gown pocket, Burnette asks if he could have or should have mentioned that to SimMan. Collazo closes the session with advice she received years ago on a simple, appropriate response that covers all bases when a patient says something surprising or distressing. The Banner Boswell site, just 15 miles northwest of the main campus, is convenient for many of the nursing students living in the West Valley. A group of 10 students learned about GCU’s nursing program while taking pre-requisite courses at Estrella Mountain Community College in Avondale. The students faced a waiting list of three years to get into nursing school through Maricopa Community Colleges, and they had concerns about tuition. All 10 students now are on presidential scholarships, having achieved GPAs of 3.7 or higher. Pondela, of Litchfield Park, said she knew she had come to the right place when orientation began with a prayer. “I feel like I’m not just getting training for a job, I feel like I’m getting training to be at the top of my profession,” she said. Brittany Anderson of Surprise said she most appreciates the individualized attention she’s receiving in the program. “I don’t feel like I’m just another grade in their book, and that makes me want to study harder,” Anderson said. Nursing will be Alicia Steehler’s second career. 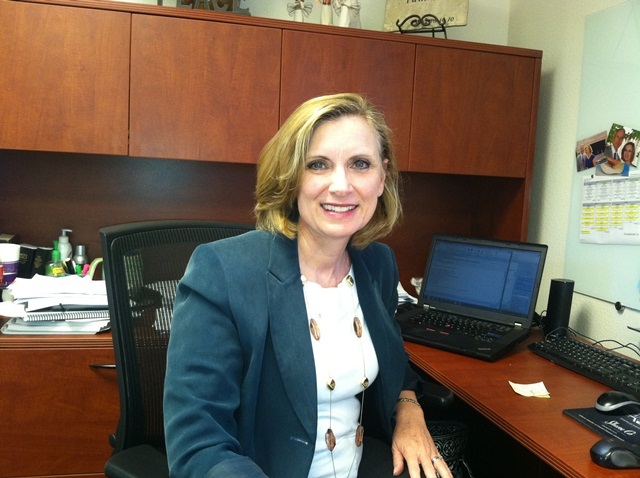 She loved her job as a project coordinator at a construction company, but when the firm went out of business, Steehler, also a single parent from Litchfield Park, had to find a fulfilling job that would sustain her family. She chose nursing. Steehler has most enjoyed bonding with the other students and working in the skills lab. She was nervous the first time she asked personal questions of a retiree who had come into the lab, but the more she spoke with the woman, the more she felt at ease and confident. “I used to think I didn’t want to work with the elderly, but in just three weeks of being in the program, I think that’s where I’m going,” Steehler said. Jeff Miller, an Army veteran from Surprise who formerly worked in retail, always had been interested in a nursing career. With family obligations, and raising his son, he never had the time before. Now he does.